a proven method to selling your home quicker and for top dollar! the Baltimore, Central Maryland, Maryland, Virginia and DC areas. No need for new… redo! 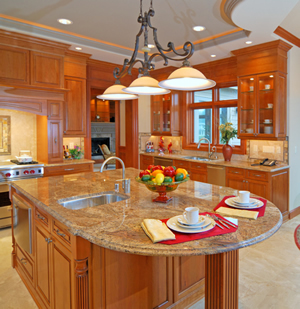 Our interior redesign industry specialists decorate with what you already own giving new function and flair to a single room or to your entire home! We rearrange existing furnishings, artwork, floor treatments, lighting and accessories — optimizing space, function and visual interest. Your possessions will be repurposed into a new design scheme and cohesive look that enhances your room to its fullest! It’s ALL inspired by YOU! Presentation… Presentation… Presentation… counts when you are selling your home! 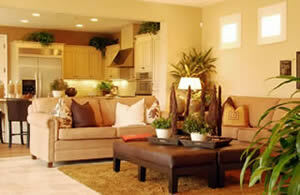 Potential buyers want to see a place where they can feel comfortable. They want to walk through a house and look at the architectural details, the layout and flow of a house and overall appearance of a house. A potential buyer is thinking whether or not this house presents a good fit and potential place to call home. With a "stage it to sell" approach, we take the guesswork out of home presentation with a thorough evaluation starting from the curb. Does your home present well from the outside or could the front door and shutters use a fresh coat of paint? We conduct a walk and talk room-by-room evaluation with the client and present changes and updates to enhance the look and feel of the property before putting it on the market. Do you have too much furniture preventing prospective buyers from seeing the possibilities in the architecture? Are there too many surfaces that "catch all" the day's clutter and need to be stored away from sight? Allow us take the guesswork out of home presentation and we'll stage your interior to a model home — feel good appearance! 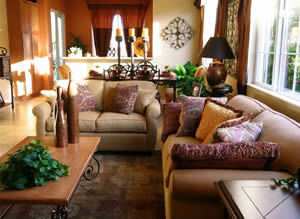 We all want our homes to be comfortable, attractive and reflect our style. Getting to this point can be a difficult task at best. Allow us to do the creative thinking by providing a design scheme that fits you and your family’s needs. Whether your room needs fresh new wall color, sofa pillows or a total redesign; we can make your vision a reality!